Hello, Friends! I'm sure you all love long weekend. I mean, who doesn't? I didn't take special outfit picture for the dinner, so here I will share some pictures snapped with my iPhone of what I wore. The dress is a little bit shorter than what I usually wear, but it's still modest. The line is simple and I wore a lot of accessories to adorn this otherwise very simple dress. It's all about the details! I bought this colorful necklace years ago, and I also wore it in this post here. It was a risky buy from an online shop, I hesitated because it looked so colorful and tacky. So glad I finally decided to get it, because it turned out an exquisite piece which has been accessorizing many outfits, including this one! Here I wore it with another outfit sometime in 2012. You can tell from the quality that this picture was NOT taken with an iPhone. Haha! This is the overall look, with the lovely red bow wedges and purse. I wasn't sure about the green and red combination, for fearing I would like an overadorned Christmas tree (in April! ), but I think I looked somewhat put together enough. I hope. And here's my stack of arm candies. I love wearing multiple bangles and charm bracelets together. Yes, I am one of those annoying people who loves to take selfie, either myself, or with my son, or with my husband. Well, some might call it vanity, that's partly true, but I also love making memories! We went to a fancy French retaurant and bistro called Le Quartier. The interior is gorgeous and the food is nice, but we're not coming back since we didn't find it to be extraordinary in terms of food, and there are so many other restaurants we would like to try. We only come back to the same establishment if the food or the ambiance is super exceptional, or it has a special meaning and nostalgia to us. I'm the kind of person who is more willing to pay for experience and memory, than stuff. 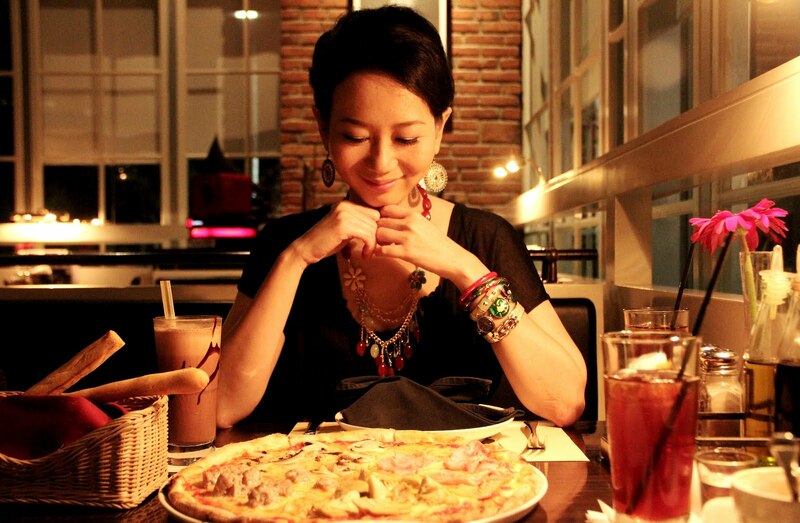 I can justify spending more than USD 250 on a lavish Valentine's dinner (once in a while of course!) in a magnificently romantic setting that I can remember for the rest of my life, yet I cannot justify spending the same amount on a pair of leather shoes, for example. I can justify spending thousands of dollars on custom-made trip to Italy, yet I cannot spend it on let's say, a Hermes bag, though I know I can even pass down the bag to my daughter since good quality leather handbag practically lasts forever. I guess we all have different spending style and preference. That evening I got out of my comfort zone and try to order something that is not my usual favorite. It's a veal dish, called veal navarin, which is basically marinated veal with peas, carrots, mushrooms, mashed potatoes, garlic, shallot, lots of herbs, cooked till tender, swimming in rich savory broth. It's not something that I would commonly order, but it was absolutely delicious! The next day is Easter Sunday, so we went to Mass, then had breakfast at a neighborhood restaurant where they serve chicken porridge with many little side dishes. Delish! We spent the rest of the day playing with our son and just relaxing at home. Our weekends are usually pretty simple. One day I asked Hubby, "Do you notice that our life and how we spend our time together is much simpler and cheaper now compared to when we were still dating?" He agreed. Having breakfast together, either restaurant-made porridge or home-made omelette and toasts now is just as cozy and enjoyable as paying for brunch at a five star hotel. I don't know why, but Michael looooooves car! Real cars, not toy cars or hot wheels! On the weekends, we allow him to sit in Daddy's car where he pretends to steer the wheel and makes broom-broom noises. So cute! We wanted to take Michael for a ride in the afternoon, but he was being naughty and didn't finish eating his afternoon snack. Soooo, no ride for that day! I insisted on being firm and keep my promises. When I said we'll take him for a ride if he finished off his meal, and he didn't, then he must know that Mommy meant business. That was our long Easter weekend. How was yours? Sounds like you had a great time!! Love your arm candy. I found a lot of bloggers though your link list. What do you mean you are linked with those bloggers? How do you link with them? We had a very busy weekend with another long weekend following for ANZAC Day. I do love an arm party! I love that dress on you! Perfect for a night out. I agree with selfies as preserving memories- I tried to make a scrapbook for husband and I had no photos of our first or second wedding anniversary as we didn't have smartphones back then! Love the dress, and the accessories! Thanks for linking up...hope to see you Monday! Pretty dress and love the non iphone photo of you-beautiful, lovely family shots too! Do You Know Coralina Grey?